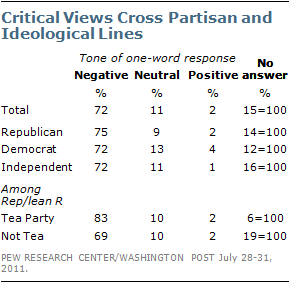 What do Americans think about how their leaders handled the deficit/debt ceiling crisis? This graphic tells the whole story. 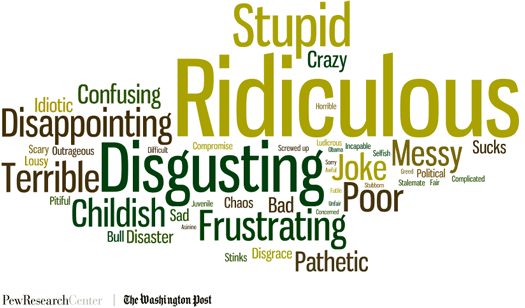 Results of a new poll from Pew Research suggest a general consensus among Americans regardless of ideology, the whole deficit/debt ceiling crisis Congress put the country through was ridiculous, disgusting, stupid, frustrating--you pick the word. Asked what they thought, nearly three-quarters of Americans couldn't think of a single positive thing to say. When it came to tarnished images, Republicans came out the worse with 42% of Americans saying the had a less favorable view of the party because of the debt ceiling crisis. Democrats did a little better but not much. 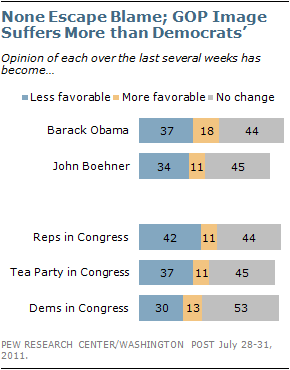 About a third of Americans said they had a less favorable view of Obama and Boehner because of their role in the mess.